Creates a new WStandardChartProxyModel that wraps the given source model. Returns the wrapped source model. A WAbstractChartModel implementation that wraps a WAbstractItemModel. 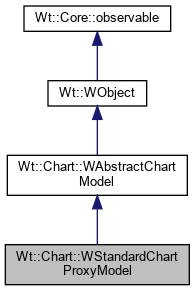 This model delegates all functions to an underlying WAbstractItemModel, using the appropriate roles. This model also triggers the changed() signal whenever the underlying WAbstractItemModel is changed. Returns the result of WAbstractItemModel::data() for the given row and column with the ItemDataRole::BarBrushColor, or null if no color is defined. Returns the result of WAbstractItemModel::data() for the given row and column with the ItemDataRole::BarPenColor, or null if no color is defined. Returns the result of WAbstractItemModel::data() for the given row and column with the ItemDataRole::Display as a double. Returns the result of WAbstractItemModel::data() for the given row and column with the ItemDataRole::Display as a WString. Returns the result of WAbstractItemModel::index(row, column).flags() for the given row and column. Returns the result of WAbstractItemModel::headerData() for the given column with the ItemDataRole::Display as a WString. Returns the link to use on a given row and column. Returns the result of WAbstractItemModel::data() for the given row and column with the LinkRole as a WLink. Returns the result of WAbstractItemModel::data() for the given row and column with the ItemDataRole::MarkerBrushColor, or null if no color is defined. Returns the result of WAbstractItemModel::data() for the given row and column with the ItemDataRole::MarkerPenColor, or null if no color is defined. Returns the result of WAbstractItemModel::data() for the given row and column with the ItemDataRole::MarkerScaleFactor, or null if no color is defined. Returns the result of WAbstractItemModel::data() for the given row and column with the ItemDataRole::ToolTip as a WString.